Some shows just give Art a bad name. Self involved, overblown and empty. This week I noticed the show had changed – it was now Francesco Clemente. Not been heard of in these parts for a while – his first show in London in seven years apparently. I had never been fond of his work but it was so cold I went in anyway. I didn’t stay long. So. Why is this the sort of work that gives painting a bad name? It has an irritating disingenuous false naive quality. It has a haphazard scattering of symbols and ‘images’ in a half digested cultural juxtaposition. 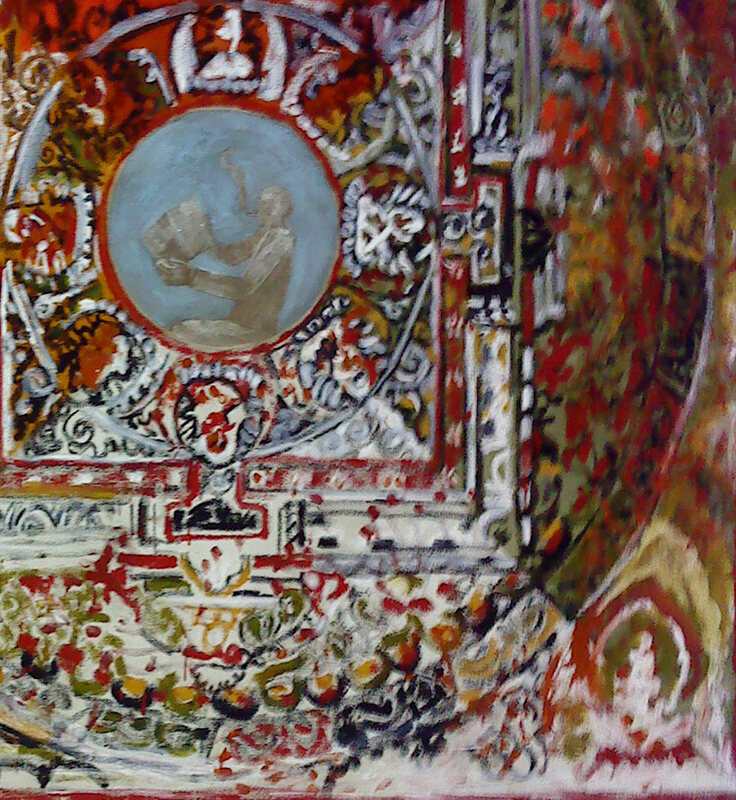 Sanskrit writing and Mandalas are superimposed on a sort of traditional western easel painting. It really is that superficial. We are told that Clemente spends much of his time in India, but there seems little that could not have come from a first impression. It is from the ‘cack-handed’ school of draughtsmanship. That is to say (in common with others from the 80s – Schnabel, Salle et al) it tries to make a virtue of crude drawing, but fails.There is a tedious list of ingredients – ‘raw linen, milk paint verdigris, silver pigment, mica…(it goes on)’ – which reads like the menu of an overpriced restaurant that can’t decide what the food is supposed to taste of. There is a notable lack of engagement with the materials though. They all seem very flat and dead. And he always seems very satisfied with his first marks, however gauche they may be. How different from Frank Auerbach who gets to grips with the material and doesn’t let go until he is certain that he has something worth keeping in the picture. Maybe Clemente paints 100 versions of each of these, I don’t know. But it all seems very casual. Each of these paintings is monumentally large. The objects dwarf the small personal statement that each one represents. There is no need for them to be this big, except to fill the over large galleries and museums. I remember the early Clemente work I saw did have an intimate quality – small frescoes about 10 inches across. There is no intimacy to redeem these pictures. Some people might say that we simply don’t possess a visual culture in this country and that we are verbal and literary and immune to poetic ideas in paintings. Maybe. Hopefully we might be immune to these vague and feeble waftings. This entry was posted in Art, London, Painting, Uncategorized and tagged Art, India, London, Painting.